Burns can be devastating and debilitating injuries. They are often very painful and the treatment of serious burns can require time and a lot of money. In addition to the emotional anguish and trauma, burns may destroy nerves, muscles and organs. Those who have suffered the most severe burns may live with scars and permanent injuries that impact their ability to lead normal lives. 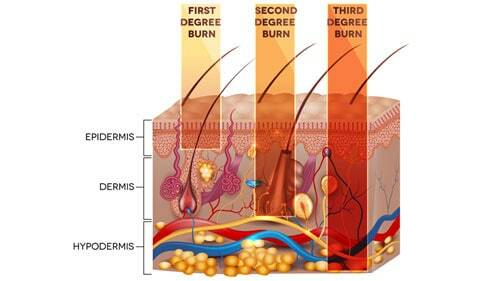 This is a guide to the different degrees of burns. In order to best treat burn victims, medical experts classify burns into four different categories. This helps them determine the best way to care for the injuries and assess their severity. Every burn causes a considerable amount of pain and the location of the burn needs to be treated to keep the injury from getting worse. A first degree burn only injures the skin and is often compared to sunburn. The epidermis is the only organ impacted by the burn and the burn can be treated easily at home. Infection is the only concern and you should seek medical care immediately if there are any signs that your burn has become infected. The signs that a burn is a first degree burn are the following. The skin might be red and sensitive. In some cases, the burn might cause swelling. Some people describe a tingling sensation in the affected area. The skin may appear dry. Running the area under cold water or applying a cold compress can help with the swelling and the heat. Do not apply any lotions or oils that may clog the pores as this can worsen the pain and increase the chance of infection. A second degree burn extends past the epidermis into the dermis. The dermis is a layer of skin that rests under the top layer and it eventually replaces your skin as the cells die and shed. Second degree burns are very painful and require careful attention during recovery. The signs that a burn is a second degree burn are the following. The telltale sign of most second degree burns is the formation of blisters. The skin will appear red or pink on the surface. If you press down on the skin, it will lighten until you lift your finger. The burn may form a scar. There are a number of things that can cause second degree burns. In the home, this can include hot liquids, open flames and electricity. On the job, it could include flash explosions, heated surfaces, machinery and chemical exposure. In the case of exposure to intense heat, the presence of blisters can be a sign that you do not have a third degree burn. Most second degree burns take up to three weeks to heal completely. These burns pass beyond the skin and can damage tissue, nerves and organs. Many third degree burns leave permanent scarring and may require skin grafting to promote healing. The permanent appearance of the scars serves as a reminder for the rest of the person's life of the tragedy endured. The signs that a burn is a third degree burn are the following. The wound is a deep red color or appears white. It is rare for third degree burns to have blisters. The skin is completely destroyed. Third degree burns are open wounds. Victims often don't feel much pain. This is because it is common for victims of third degree burns to be in shock or for nerve damage to occur. The burned tissue needs to be removed before the injury can heal. New skin is grafted onto the wound in order to replace the skin that was lost. Third degree burns happen for many of the same reasons second degree burns do. The victim may have been exposed for longer, causing the burn to penetrate the lower layers of skin. Most people are unaware that fourth degree burns exist. This classification was created for burns that are so severe, they have reached muscle tissue, nerves and even bone. There is nothing that can be done to promote the healing of the tissue lost to these burns. Most victims undergo amputations of affected limbs in order to save their lives. Rosenfeld Injury Lawyers has collected millions of dollars on behalf of burn victims. Whether you were burned while on the job or at home or if your injury was due to the negligent actions of someone else, you have the right to recover compensation. The compensation you may be entitled to can include the cost of medical treatment, out of pocket expenses, pain and suffering, lost income, loss of consortium and more. We invite you to contact us today to schedule a free case review with an attorney. We will review the details of your claim and let you know more about your rights and options. We guarantee never to charge upfront legal fees and our services will be free if we cannot collect compensation on your behalf.